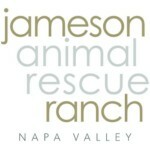 Jameson Animal Rescue Ranch is a 501(c)(3) registered nonprofit organization (#47-1230166). The Jameson Animal Rescue Ranch’s WineaPAWlooza 2017 fundraiser event and wine auction raised 1.3 million dollars. This event included red carpet arrivals, a Pet Parade, auction tent and Large Animal Emergency Response Vehicle.